I love me a good infographic -- especially when it's an infographic about infographics. So when I came across this awesome one from Socially Sorted, I had to give it some love. And the "7 Superpowers of a Knockout Infographic" infographic doesn't just spew out some stats about infographic usage. It actually supplies some great tips and best practices for developing one of your own -- so you can create an infographic that actually gets shared, generates traffic, and attracts valuable inbound links. Highlighting the three steps to developing a successful infographic (storyboarding, design, and promotion), the infographic (as well as its accompanying blog post) also breaks down a successful infographic's seven key components -- story, style, simplicity, size, stats, shareability, and sources. See for yourself! Then check out the resources at the end of the post for some more tips and resources for creating your own successful infographics. 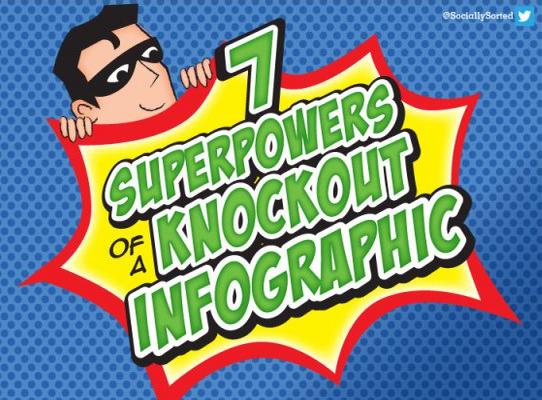 "7 Superpowers of a Knockout Infographic"